I once worked for a Professor who said that when he died and found himself before St Peter at the pearly gates he was going to ask for all the time back that he had wasted waiting in airports for delayed planes. I doubted that he would realise his wish, not because St Peter would look unfavourably on his request, but because I never thought he would get a chance to ask, having been whisked after death in an entirely different direction. Hell for him and for many would be an eternal waiting room, with flickering screens telling you that your flight was delayed, then further delayed. It would never actually be cancelled, but you would be on an eternal fool’s errand waiting for the flight that you desperately needed to catch, but which would never come. I am writing these words because I currently find myself in this very state of perdition. 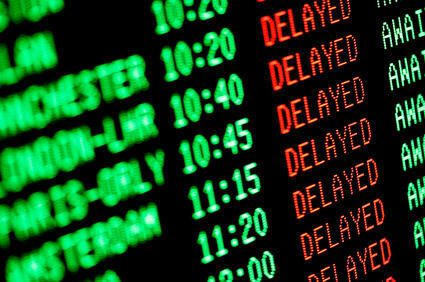 A simple commuter flight from Glasgow to Belfast, a flight that takes only half an hour, is delayed by two. As a life-long anxious traveller I inevitably arrive at the airport, or the bus station, or even the dentist’s waiting room excessively early. Today is no different, and to find a two hour delay merely adds insult to the temporal injury already imposed by my anxiety. What to do? Where to sit? To eat? To drink? To blog? Perchance to dream? These are the questions I face and which everyone in my situation weighs up. I am fortunate to be in an airport that still seems to be open – I have been in several that have effectively closed as soon as the delayed sign went on the Departures screen. There are places to eat, to drink and to listen to throbbing electronic music. In fact, everywhere I have tried to sit or eat or drink is well served by the music. A little too well served in my opinion, as my ears are just beginning to bleed. There is even piped music of the same variety in the toilets – can’t even have a seat in there in peace. There are shops which offer some respite. ‘Home and body cosmetics’ one shopfront declares. Whatever it is that they sell, it’s ‘up to 50% off’. I will investigate and doubtless discover how my home needs half-price cosmetics. Next door is the duty free. How is it that when you are flying from one part of the UK to another you can engage in the subterfuge of duty free? I am sure there is a perfectly good and reasonable explanation, but it escapes me. Next up is a green sign showing a small running man, denoting the emergency exit. Please. What can I learn from this experience and more importantly from my reaction to it? I am supposed to be able to write about discovery, so perhaps I should turn the energy I am using to fuel my frustration and pique and my search for ever more exotic combinations of swear words, into a search for something more valuable. Experience is the river we all find ourselves waist-deep in from a very early age. Its flow is never constant and its undercurrents unpredictable. All I am experiencing is a temporary stagnation in my river when I had been expecting white-water rafting. I was poised: now I find myself paused. That clash of expectation and reality is, as always, a little jarring. No matter how often we experience it, we can still be surprised. And, that in itself is surprising, isn’t it? Why have I not developed a better strategy to deal with this by now? Why do I still have a swearing fit when I see ‘Delayed to 21:45’ on my 19:45 flight? Where is my stoicism; where is my maturity? I am supposed to be on a plane going somewhere. Instead I am sitting waiting to find out if I am ever going anywhere tonight. I’m annoyed, angry, frustrated, bored, anxious and anything but relaxed. But, I’m also breathing, able to think, and I am not in any real pain – apart from the existential kind you always get in airports. On balance, and balance is a difficult thing to achieve just now, but on balance, I’m really OK. Better than OK actually. All my vital organs are working, more or less, I have most of my teeth, and I can write. As I write I speak to myself, hoping the drivel will turn into something profound. That some nugget of wisdom will form from the tangle of words on the page. High hopes? Yes, but laudable ones. So, what has this self-reflection yielded? That I am a little less than I hope to be, but that there is hope for me, nonetheless. Perspective, context, circumstances – all a bit abstract, but essential to understand anything and place it in its rightful box. Two hours delay in the big picture, the grand plan, is one twelfth of one day, of one of the 25-30,000 days I might hope to spend on this earth. Or, in other words, not very much. And, has it evaporated and been taken from me by the thief of time? No, I get to spend this 0.001% of my life simply doing something different to that which I planned. In my case, I get to spend it thinking and writing. I am always bemoaning the fact that I never have enough time to think or write. Well, here I am with a gift in my lap. And, my view of it will depend on nothing more than my attitude – grumpy or grateful. If I choose grateful, I suddenly feel a little less hypertensive. How we view those river currents in which we find ourselves and how we choose to deal with them is what makes all the difference to a life of optimism and wonder from one of despair and self-pity. Choose to see the rapids as excitement, and the rocks in your path as challenges rather than obstacles placed there by a malevolent god. Choose to regard the pools as opportunities for taking stock and time to think, rather than a useless waste of time. Choose to go with the flow or fight it, as necessary. Choose. But, all the time find pleasure in the water, for all too soon the river runs dry and the ride is over. What did I discover today? That, if life is a river I better learn to enjoy being wet, instead of wishing to be dry. Anton Chekhov wrote in his notebook, “Man will only become better when you show him what he is like.” Whether this confrontation with reality will allow us to raise our game must surely rely on the nature of that meeting. We are innately biased when it comes to reviewing our own selves. Take, for example, our view of body size. This would seem to be a very simple level of perception and really quite basic, but we fail, especially if we are women, to achieve this. When a group of women are asked to draw a life sized representation of their body outline on a wall and then asked to step into this picture, everyone will have drawn an image significantly larger than their own body. “Does my bum look big in this?” we are asked because the questioner genuinely does not know. If we fail to perceive our physical bodies with any clarity what hope have we for any deeper level of self-knowledge – a much sought after commodity. My own National poet, Robert Burns, wrote, “Wad some power the gift to gie us, to see ourselves as others see us.” I suspect Chekhov probably had something more in mind. Perhaps he believed our betterment was not just about seeing ourselves as others see us, but about observing humanity itself with fresh eyes and in a brighter light than anyone has previously used. A large part of scientific research is about shedding new light on Man. We study our cells, our thoughts, and our actions hoping to discover something new and to answer questions. By careful analysis of Man at these different levels we hope to learn new insights about our species and about ourselves. Are we the only species with the power, or indeed the desire, to study ourselves? Yes, we are, but just because we are does not necessarily mean we are ready to cope with what we discover. Science holds a mirror up to Man, so that we might see what we really are. In the past, these mirrors have often presented a distorted reflection, because our methods of working were imperfect and our knowledge incomplete. But, as we improve, the images become clearer. The world once obviously flat is now round; the sun, which so clearly revolved around our Earth, now sits firmly at the centre of our solar system; and the mysterious stuff of life is now uncoiled as a double helix at the centre of our cells. These mirrors are our methods and at their heart are the questions we ask of ourselves and our world. Asking the right question, and doing so clearly, might be the work of the artist and the writer, but it is certainly also the beginning of science. However, it is only by seeking out the answers to these articulated questions that we become scientists. Perhaps, the best scientists are also artists and writers at heart with the ability to question well, but to make a mirror you need to be a scientist. 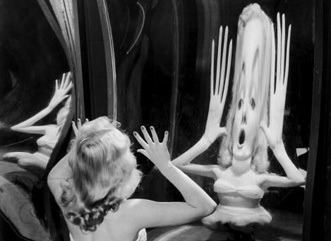 Funhouse mirrors show us twisted visions of ourselves. Grotesque and foreshortened, stretched and bestial, but nonetheless reflections of what we are. If we have no other reference point we may judge these images to be the truth. Sitting in Plato’s cave we gawp at dancing shadows of firelight on the wall believing them to be reality. Similarly, our mis-reflections through the mirrors of superstition and ignorance show us as we imagine ourselves to be until we learn otherwise. Science is about giving us fresh perspective and allowing us to leave the funhouse and view ourselves with fresh clarity. There may still be ripples in the mirror, but the view of humanity we now have is the clearest we have ever enjoyed. Science will continue its progress and make new mirrors; let us hope we can learn and better ourselves from what we see in them, just as Chekhov dreamt.